Chemistry: KLi2Al(Al, Si)3O10(F, OH)2, Potassium lithium aluminum silicate hydroxide fluoride. Uses: ore of lithium, ornamental stone and heat insulator for industrial purposes. Color is violet to pale pink or white and rarely gray or yellow. Crystal Habits include tabular to prismatic crystals with a prominant pinacoid termination. 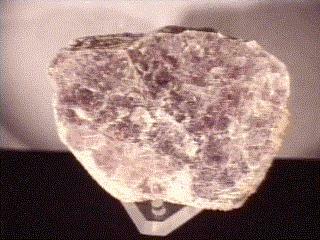 Lepidolite's four prism faces and two pinacoid faces form pseudo-hexagonal crystal "books". The sides of the crystal often tend to tapper. Also as micaseous, lamellar or granular rock forming masses. Cleavage is perfect in one direction producing thin sheets or flakes. Fracture is not readily observed due to cleavage but is uneven. Associated Minerals are quartz, feldspars, spodumene, ambygonite and tourmaline especially elbaite. Other Characteristics: cleavage sheets are flexible and elastic, meaning they can be bent and will flex back to original shape. Also some specimens may show triboluminescence. Notable Occurrences include Brazil; Ural Mountains, Russia; several African localities and California, USA. Best Field Indicators are crystal habit, color, cleavage, elastic sheets and associations.